A meeting of the Wards Corner Public Art Planning Committee (WCPAPC) was held at the Selden Arcade on August 20, 2013. City staff (Planning Department, Parks & Rec, Public Works), representatives of the community, and representatives of the Norfolk Public Art Commission were in attendance. A Request for Proposals (RFP) is in the early stages of being drafted by the WCPAPC. The RFP will likely outline the possible locations for public art in the Wards Corner area. Some of the preliminary areas identified included some of the medians on Granby Street, the HRT bus transfer station, and possibly some space in front of the new Harris Teeter anchored shopping center. The RFP will also give direction for the site specific artwork but will likely be vague to allow for the artists to make unique proposals. Once the RFP is finalized it will go out to artists nationally. It is hoped that the RFP will be completed in time such that the artists responses will be due by the end of October. The WCPAPC will then reconvene to review the submissions and work towards selecting an artist for the project. The City of Norfolk currently has $150,000 to use for this public art project in Wards Corner. Thanks to The Suburban, the Newsletter of the Suburban Acres Civic League, for the following article. The new, 7500 square foot Dollar Tree is open at Wards Corner in the space formerly occupied by the Number 1 China restaurant at 7635 Granby Street. The store opened July 17th, and celebrated its grand opening on the 19th. Dollar Tree’s Store No. 5000 returns to Wards Corner where the chain began. K.R. Perry’s Norfolk Ben Franklin stores and the “5 & 10” area of K.R. Perry, Doug Perry, and Macon Brock’s K & K Toys were the basis of the future “everything for a dollar” concept. In 1986 “Only $1.00” Store Number 1 opened in Wards Corner along with two other Virginia stores, and one each in Tennessee and Georgia. The K & K Toys side of the business was sold off to KB Toys so the business could focus on their everything for a dollar concept; the name of the stores was changed from Only $1.00 to Dollar Tree in 1993. 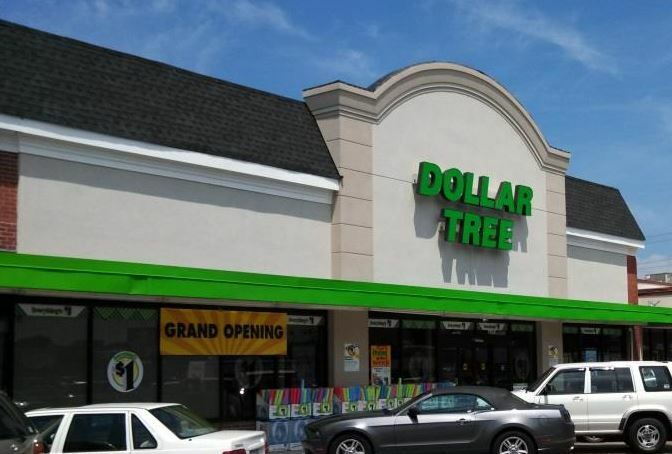 Dollar Tree Stores is now a publicly traded company, and earned a place in the Fortune 500 in 2008. The former Wards Corner Dollar Tree store in Suburban Park Shopping Center closed last year to make way for the site’s redevelopment. Store Manager John Corwin is excited to welcome the customers back and said, “We are just really glad to be back in Wards Corner.” Corwin said all or the store’s associates are new hires, but two of the assistant managers are from the previous Wards Corner Store. Corwin came from the Dollar Tree Deals side of the company, and has been with Dollar Tree for about a year. Corwin’s prior retail experience includes 11 years with Dollar General, where he was a district manager. The new Dollar Tree is spacious, and includes a refrigerated and frozen foods section. Dollar Tree’s first distribution center, its store support center, and company headquarters are located in Chesapeake. You are currently browsing the Wards Corner Now - Wards Corner, Norfolk, Virginia blog archives for August, 2013.